7 Nights in a Studio or 1 Bedroom in St. Maarten! 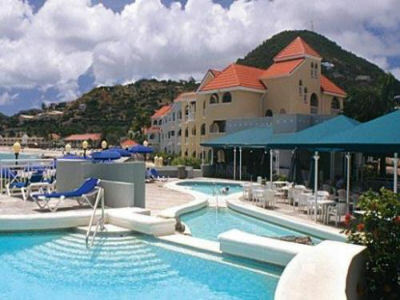 Divi Little Bay Beach and Racquet Club in Philipsburg, St. Maarten - Buy a 7 Night Stay in Studio or 1 Bedroom Suite! Enjoy 7 Nights at the Divi Little Bay Beach and Racquet Club in Philipsburg, St. Maarten! Saint Maarten provides the European charm, while nature provides unspoiled beauty. Divi Little Bay Beach and Racquet Club does the rest, setting the stage for a perfect vacation getaway. It starts with the palm-fringed beach, just minutes from the quaint Dutch capital of Philipsburg. Freshwater pools, tennis, and water sports are also available on-site. And when the sun goes down, eat, drink, and dance at Little Bay Beach and Racquet Club's Toucan Cafe (one of three on-site dining options), or step out for a lively night on the town. Divi Little Bay Beach & Racquet Club is situated on a private peninsula between two gorgeous bays in Dutch St. Maarten. The convenient location is just minutes from the Caribbean's best shopping and dining, yet it feels private and secluded. The area offers an abundance of activities, including outstanding opportunities to explore the many multicultural highlights, from tiny fishing villages and secluded beaches to bustling, but quaint Dutch capital of Philipsburg. A variety of island tours are available, offering an up-close look at many of the finest points. All units come with flat screen televisions, clock radio with iPod docking station, DVD player, and full or partial kitchen with granite kitchen countertops, wood cabinets, and porcelain tile. Your STUDIO UNIT sleeps up to 4 guests with a King size Bed and a Sleeper Sofa Bed. A Full kitchen including, a coffee maker, dishwasher, full size oven/stove, cooking utensils, microwave oven, kitchen sink, cutlery, and refrigerator is also featured. Your unit will have central air conditioning, a ceiling fan, furnished balcony, in-room safe, and much more are also yours during your stay! Your 1 Bedroom Unit - sleeps up to 4 guests with a King size Bed and a Queen Sleeper Sofa Bed. A Full kitchen including, a coffee maker, dishwasher, full size oven/stove, cooking utensils, microwave oven, kitchen sink, cutlery, and refrigerator is also featured. Your unit will have central air conditioning, a ceiling fan, furnished balcony, in-room safe, and much more are also yours during your stay! A security deposit is required at check-in. A $50 government occupancy tax will be assessed per unit, per week.